FINANCIAL More vs. Less alternatives. Granted, I’m no expert… These are all just thoughts and ideas. No one should attempt to do it all. Simply put the pieces together to craft the complete puzzle that best fits you!! Save more. Spend less: Prepare for your rainy day, car repair, furnace replacement, whatever mishap that surprisingly comes your way. Start by putting away a small amount each month. Perhaps it is $10. Maybe it is 10% of your paycheck. Do what feels right for you. Make it automated by setting up a direct deposit into a saving account, so you won’t forget. Over time you won’t miss the amount you’ve saved. When you reach that stage… increase the amount or percent you’re saving!! Grow your nest egg. Thankful more. Need less: Gratitude magnifies. When your gratitude increases, you find your desire for more decreases. Each day find a reason to be thankful. Write it down. Find pleasure in what you already have rather than need/want more. Besides, at what point is enough… enough? Focus on what YOU have and be grateful. Budget more. Waste less: Ever wonder where in the world your money goes? You get paid on Friday and by Monday your money is GONE!! Whhhaaaattt? Pay attention. Organize your pay (input) and spending (output). Really focus. Keep track of spending for a month and it may surprise you where you choose to put your money. Make adjustments. Create a detailed budget. Put limits on each category: necessities (household expenses), shopping, food (groceries and eating out), etc. Hold yourself accountable and stick to it. Before you know it… you will know where every penny of your check goes and why!! Create more. Consume less: Find ways to “Do it Yourself” rather than purchase consumer products. For example, buy groceries and cook meals at home rather than eat out at a restaurant. 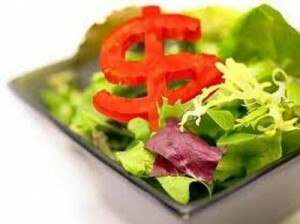 You will save on calories and expenses!! Make home cleaning supplies and beauty remedies. You will spend pennies on the dollar. In the process you may find you go green and waste less!! Value more. Want less: Define yourself by who you ARE rather than what you HAVE! As soon as you shift your focus you will be amazed at how your wants disappear. You have an old-fashioned TV? Who cares. Does it still work? Use it until it dies and only buy what you need. No need to try to keep up with the Jones. They are in debt too; they just aren’t talking about it!! Live BELOW your means rather than within your means. Value yourself over material goods. You ARE enough, right? Yes, Yes, you are enough. Invest more. Work less: Put money away for your future NOW, so that you can retire earlier; hence, work less. Maximize your company’s retirement contribution. If your employer offers a match, definitely contribute up to the match. By not doing so, you’re turning down free money. Each year increase your contribution by 1% and stop when you reach the maximum contribution amount. Then let it ride. Do not look at statements and worry about how much you’ve gained or lost. Investments take time. Let it go and you will see it grows over time. A loss in the market while you’re working truly is not a loss because you’re not in retirement yet. If your company does not offer a match, then look into an Individual Retirement Account (IRA) or Roth IRA. Either way… invest in YOUR future!! Pay more. Billed less: If you have revolving debt (credit cards) then pay more than the monthly minimum due in order to save on interest. Pay off your balance each month if you can so that you avoid interest all together. If you have installment loans (car loan, mortgage, student loans, etc.) then pay your payment amount in two equal payments. For example, if your car loan is $400 due on the last day of each month, then pay $200 the first week and $200 the third week. You cut your interest accrued by doing this and therefore pay off earlier. Every penny adds up. When you can afford it make an extra payment on your installment loan, yet be SURE to indicate you want the full amount to go towards principal. If you forget then the financial institution actually lowers the amount of your monthly payment instead. Evaluate more. Lose less: Look over all financial documents. Each year, check your credit reports and FICO scores to stay on top of things and ensure no mistakes or identify theft. Each month, examine your bank statements, credit card bills and the like to ensure accuracy. Mistakes happen. Find errors and avoid unnecessary fees. More and more today, many employers, landlords and insurance companies also check your credit reports. So keep an eye out to ensure you are gainfully employed, have a place to live and pay a fair amount for your car insurance premiums… not to mention pay lower interest rates. According to several experts, you FICO goal = 760 or above!! Your FICO score is your financial SAT score. Keep it high. Score big!! Cash more. Credit less: Pay with cash. If you do not have cash, perhaps you do not need it. Think about it… you walk past a window and see a GREAT SALE, so you cannot resist. You make the purchase, save 25% on your purchase, yet put it on your credit card. IF you carry your balance, and only pay the minimum balance, over time your interest will exceed the amount you saved in the first place!! Cash-n-Carry is the only way to GO!!! Earn more. Blame less: Make what you’re worth. You’re responsible for your prosperity. If you deserve a raise or promotion, ask for it. Do the research. Be prepared. Make a case. You are your best public relations firm. If you’re told no, then decide if it is time to move on to a better opportunity or not. If you do nothing… but complain… no one is to blame, but you. So grasp the reigns to your professional growth and make it happen!! Honest more. Destroy less: Start by being honest with yourself about your financial situation. Accept it. Share your situation with others. Own it. Be truthful with your friends and family. Ignoring your financial health is dishonest. Lies destroy relationships. Be open. Live in your truth. You may be surprised how many people are in your situation too, yet they let shame seal their lips. Ultimately… when it comes to money cast away your fears!!! Release any negative thoughts or emotions you have surrounding money. Money is not bad. Money is not evil. How people manage it might be unless changes are made. Envision abundance, wealth and prosperity are yours and soon… it will be yours! !